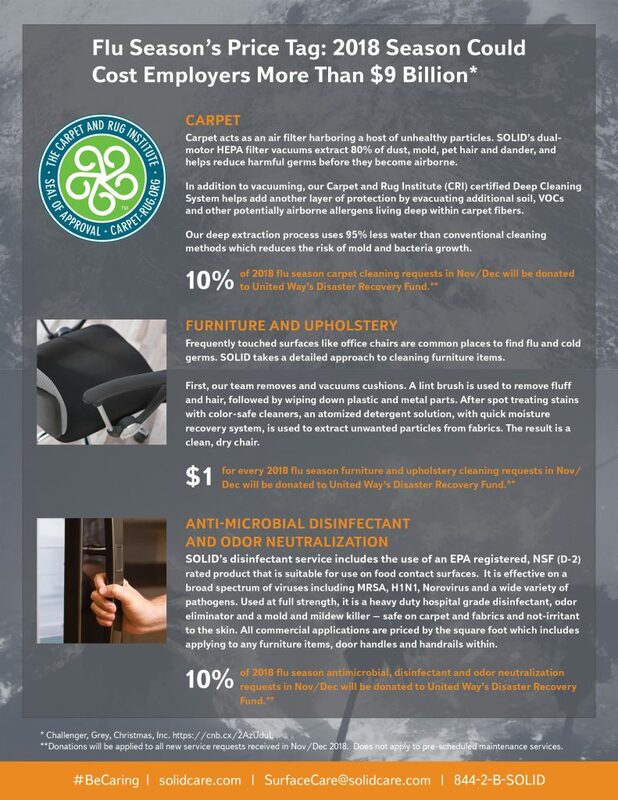 SOLID Charity Drive 2018 - SOLID Surface Care, Inc.
BE CARING: At SOLID we care about our people, families, communities, clients, and planet. 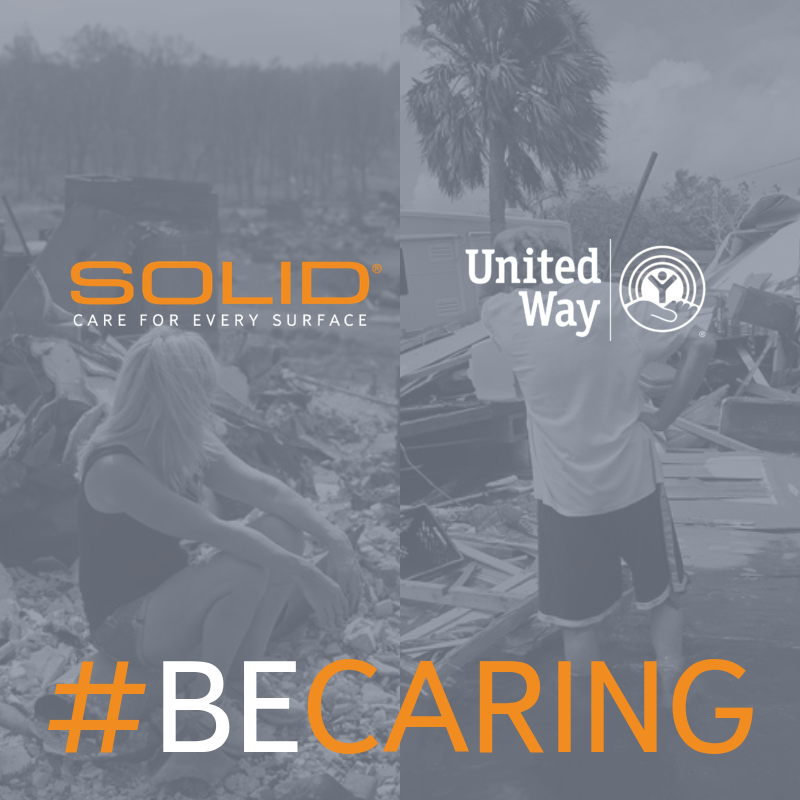 SOLID Surface Care Inc. is proud to announce they are supporting United Way’s efforts to bring financial relief to our neighbors nationwide who have been impacted by natural disasters in 2018. Each year as the weather turns colder, SOLID receives requests for additional services from facility managers mindful of the negative impact of workplace illness. 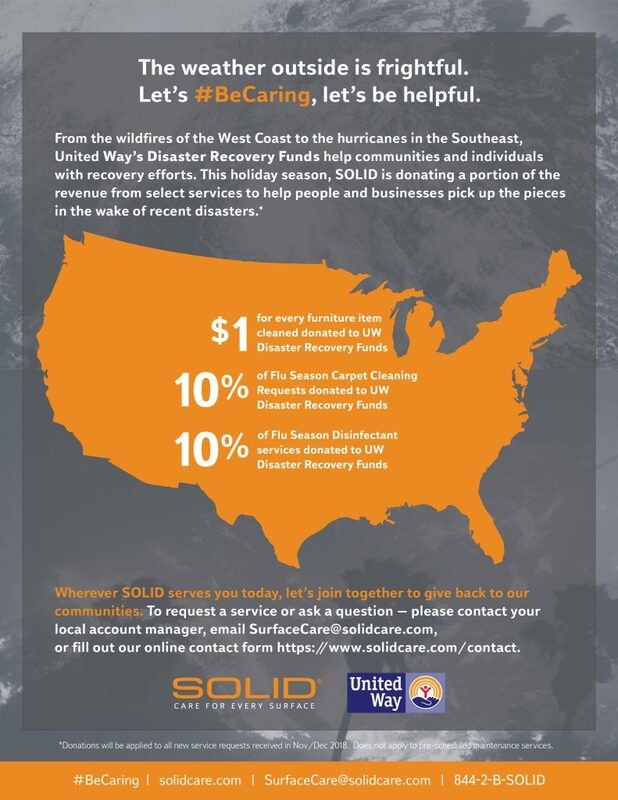 This year, not only will SOLID answer those calls, but we’re pledging to donate a portion of revenue from winter service requests to United Way’s Disaster Recovery Fund that helps communities and individuals with recovery efforts. The wrath of these events have been felt by the SOLID family. Georgia native and SOLID Surface Care, Inc. CFO, Lynn Comstock shared the impact on her family and her hometown, “I grew up in South Georgia on a farm. My family and neighbors have been greatly impacted by Hurricane Michael. Not only have homes been damaged and many are still without electricity and water, but their crops were also destroyed which means their annual income has been erased. Crop insurance does not pay enough to recoup not only costs of the crop but the cost of equipment and income to the farm. We may lose many farms because they can’t handle debt load”. Wherever SOLID serves you today, let’s join together this holiday season to give back to our communities. To request a service or ask a question – please contact your local account manager, email surfacecare@solidcare.com, or fill out our online contact form by clicking here. SOLID Surface Care, Inc., is a unified team of surface care experts who deliver the highest level of care for all hard and soft surfaces while providing a world-class client experience. With SOLID, your surfaces are protected, your spaces are kept clean and healthy, and your expectations are exceeded. From carpet to stone to metal and wood, we care for the most precious surfaces in the world – Yours. Please contact SOLID for more information 844.227.6543 ext. 3 or visit solidcare.com. *Donations will be applied to all new commercial service requests received in Nov/Dec 2018. For more information on SOLID, please contact us. SOLID Care announces strategic alignment with FILA USA. SOLID Restores Old Terrazzo Flooring in a Minnesota High School.